Robyn G., whose blog is, Captivate Me, hosts the One Four Photo Challenge. We select one photo which we use for all four weeks of the month. Each week we photo edit our selected photo and explain our edits in our post. 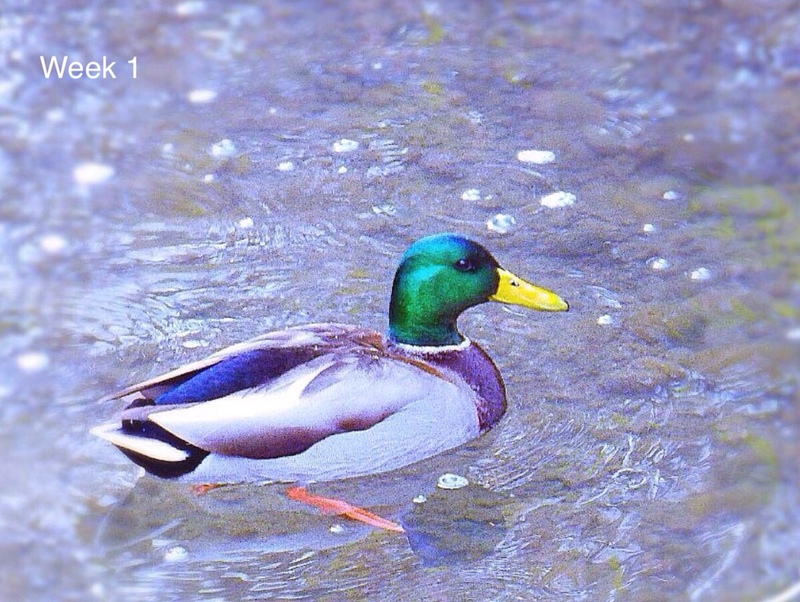 This week I have taken the original photo and put it in Aviary > Scenery> Portrait. Next, I put the image in iColorama through Brush > Colorize > Blue (the water only). When I colored the water it also colored the white bubbles in the water. Next, in iColorama, I put the image through Effects > Flow, then Adjust > High. 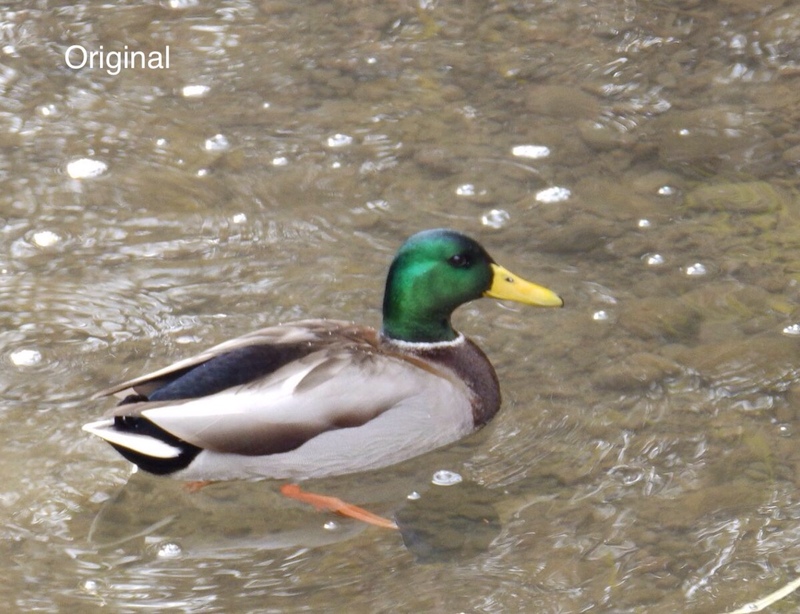 This whitened the bubbles and defined the duck a bit more. I am finding this is a difficult image to photo edit so it will be interesting what the results will be for my next two weeks. Really nicely done! Seems like you’re having fun with it!! Thank you Terri. I do all my computer work on an iPad with a blue tooth keyboard. Last week everyone told me my photo’s water was lilac. LOL! It looked blue on my iPad. So I tried to do it a little different today. Thank you! I am finding out that I chose a very difficult photo to edit! Especially so because I use, exclusively, an iPad with a blue tooth keyboard and my editing tools are not as sophisticated as those you can get with a regular computer. It will be interesting to see what I will be able to do with it in the next few weeks. Might be a major fail! LOL!! Don’t worry you’ll get a wonderful result! I need your help. I have been searching and searching in my subscriptions for your blog (vailiantwarrior) and I cannot find it. When I put in the url it is telling me I am already following it. I need to find it so I can make sure I am getting instant emails from you. I need your post in my email so I can add it to my next Saturday Blog Introductions. What is the name of your blog? If it is valiantwarrior, why am I not finding it? I just found it! Looks like two different Avatars though. Just saw your comment. Thank you for your time in finding the solution of the problem. Do I need to make some changes in my settings? Your blog is strange for the fact that it is “Story Teller” and you are NatureLover and valiantwarrior. That is going to make it very very difficult for people to find you. You might want to do some changing there with either Nature Lover or valiant warrior. You might want ask Jen Hooks or Michelle Weber what you should do. For some reason your avatar for your blog and then for your emails looks like two different images. I can’t figure that one out. I need your favor can you tell me that how can I reach Michelle Weber or Jen Hooks? I’m quite worried about this problem. http://WordPress.com/Help – see if that will get you to it. Let me know! Please don’t be worried about it. We will be able to get it fixed (if it even needs to be fixed-which I think it does, but WP folks may not). I think it will be a very easy fix too. Probably nothing more than changing your email address on WordPress or something. Thank you! The Week 1 photo doesn’t look purple (violet or lavendar) to you? I had several people tell me it did. I work on an iPad with a blue tooth keyboard and thought that was why. The water isnt purple this time around 🙂 It almost has a watercolour painterly effect this week tho. Thank you Stacey (Is it ok if I call you that?) I didn’t realize how difficult of a photo I had chosen to photo edit. I am finding anything I can do to this photo without it looking hideous is very limited. Also due to the photo editors I have access to on an iPad. Thanks for the feedback!! Great job! This is my favorite version so far!!! It really doesn’t matter what color anyone thinks it is! And there is no need to apologize for what you do! Just keep doing it! The pebbles look greeny brown or the water? I tried to get some “blue” in the water (without it becoming lavender haha). Oh okay, I tried colorizing the water with a little blue so it wouldn’t look greenish brown. Well, I tried to put some “blue” into the water but I didn’t use much opacity. I may need to hike that up a bit. I quite liked the first week, which DID look lilac to me, but week 2 is now my preference. Nice work. a lovely painterly type effect!! PJ I really like your result this week. The water is wonderful and Mr Duck is very handsome this week. I like the highlights – they bring freshness to the image. Good luck with the next 2! 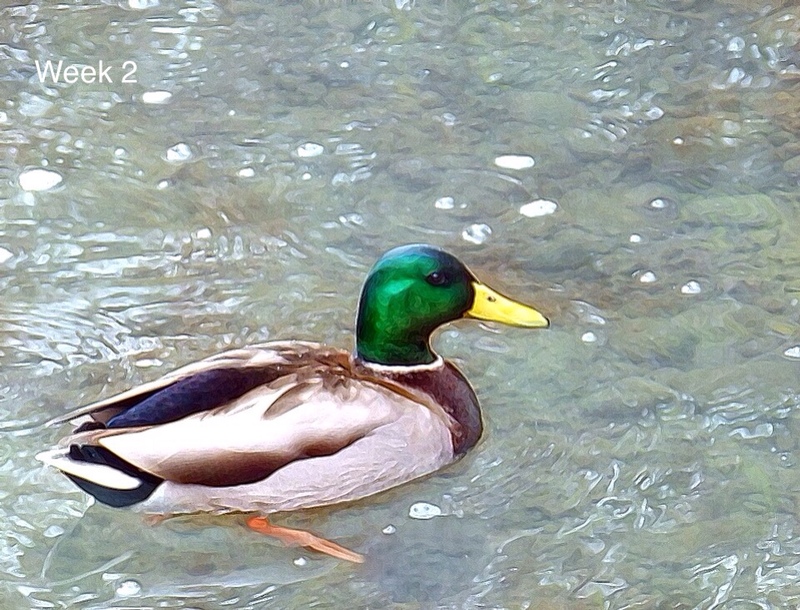 I like the details in the duck this week, and the water looks more… natural. I like how you’re creating subtle changes, but ones that impact the image. Thank you! Your opinion matters, so thank you for your critique. I too felt I could see the rocks better but is that even possible to make photo edits on water to make it clear? Last weeks image was interesting. I like this weeks edit more, much more natural with a lot of definition. Very fresh natural feel to this edit PJ. Maybe B&W for a future edit? Okay! That may be the only option I have at one point. So, yes! Excellent work, I use my iPad for reading. I must say the colors of the duck are amazing, truly amazing. Thank you so much! He was a pretty mallard.